iOS 7: it doesn't just look different. You may recall that, this time last year, Apple hinted that a feature called Inter-App-Audio was set to be implemented into its iOS 6 update. This got iOS musicians wondering if they would soon be able to use the audio streams from multiple apps together in a single project. However, when iOS 6 was launched, this kind of functionality was nowhere to be seen. Since then we've had Audiobus and JACK Audio Connection Kit, third-party tools that do enable you to use iOS music-making apps together, but with the announcement of iOS 7, Inter-App Audio is back on the agenda. In fact, it's no longer something that was just mentioned in passing - it's listed on the iOS 7 Developer page of Apple's website. As such, it's safe to assume that it's definitely happening. Discussing Inter-App Audio, Apple says: "Now your apps can make beautiful music together. With Inter-App Audio, apps can register their audio streams to share with other apps. For example, a series of apps could publish audio streams of instrument tracks while another uses the combination of these streams to compose a song. Inter-App Audio also provides for MIDI control of audio rendering, remotely launching other registered Inter-App Audio apps and more." A lot of this sounds similar to what Audiobus and JACK do already, although MIDI control of audio rendering is something new. How the feature will be implemented and what impact it will have on its third-party rivals remains to be seen (the fact that Apple already supports Audiobus in GarageBand indicates that it has some degree of support for it, let's not forget), but it does seem likely that iOS 7 will enable better integration of your music-making apps. 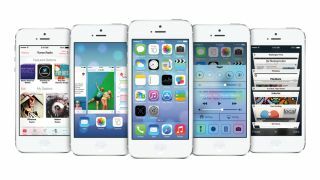 Apple iOS 7 will be released in the Autumn as a free update for iPhone 4 and later, iPad 2 and later, iPad mini and iPod touch (fifth generation) users. UPDATE: The Audiobus team has just posted a blog in reaction to the Inter-App Audio announcement. The key section is this one: "We're excited about the great work the Core Audio team have done on the new functionality, which has some terrific features that only a team at Apple with system-level access could achieve. It validates the work we've been doing with Audiobus, and will pave the way for some great user experiences to come. "While we can't talk specifics, as we're bound by Apple's Non-Disclosure Agreement, we believe Audiobus is going to continue to be a valuable member of the community, bringing music apps and devices together. We've got big plans, and we look forward to sharing the results with you!" Read more at the Audiobus blog.